The Cortech Sequoia XC Air Touring Pants are ready for any warm weather adventure just like the Sequoia XC Jacket they zip to. A removable waterproof and breathable Rainguard barrier combines with zippered side vents and a breathable stretch material in the inseam to keep you cool on hot days. 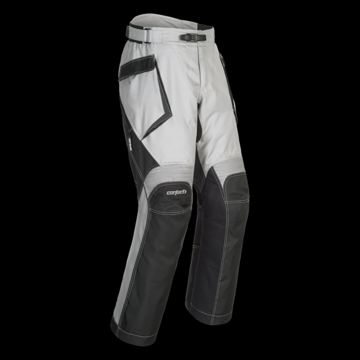 Cortech’s three-position knee armor is removable to accommodate your own personal knee brace if needed and the pant cuff features a large amount of adjustability to accommodate all different kinds of off-road and MX boots. • Performance cut, Armor-Link 3 mesh, 600 denier Carbolex® shell with 1680 denier Ballistic polyester knee panels for abrasion resistance. • Durable, 1680 denier Ballistic Polyester seat panel to minimize slipping. • Zipper fly with belt loops. • Accordion-Style expansion panels at the rear waist and above knees for increased flexibility. • Removable, CE-Approved knee armor with Cortech’s 3-Position Knee Armor Alignment System as well as removable soft hip armor. • 500 denier Spandex Carbolex® material in inseam for a performance fit. • Side entry leg zipper up to the calf allow for ease of dressing. • Features 8” pant/jacket zipper attachment with the jacket sides included.